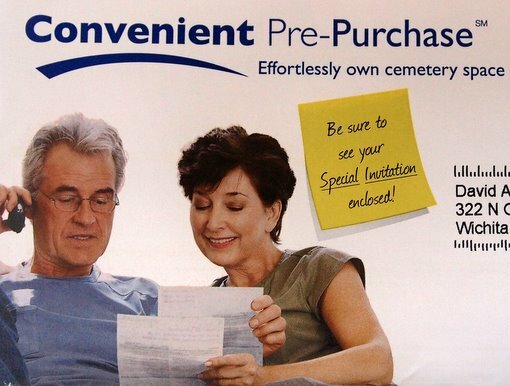 Here’s the kind of mail I get these days: exciting offers to buy my own personal grave site. No doubt marketing research has shown that this kind of solicitation is effective with people who have reached a certain age. But I think I’m going to pass this time. There are just too many things wrong with this particular approach. Start with the “Convenient pre-purchase” call to “effortlessly own cemetery space.” Sure, OK. But what could be more convenient and effortless than letting somebody else do it? Say, after I’m actually dead? Then the picture of the guy and his wife, who look like they’re buying Taylor Swift tickets instead of a great big hole in the ground. Notice only the wife is smiling, perhaps knowing something her grayish husband does not. But maybe I watch too much film noir. I didn’t check out the “special invitation” inside, just guessing that it would contain no cash. Like the phonebooks and holiday catalogs and the rest of the junk mail, it went straight into the trash. Sorry, cemetery merchants, but I ain’t dying yet. And until I am, I’ve got bigger fish to fry. Excellent Country Joe reference in the title.